The E30 generation BMW was a significant improvement over the E21 that it replaced, but more in the evolutionary sense than revolutionary. It was still powered by inline-4 and inline-6 M-series engines, used rack-and-pinion with MacPherson struts up front, and semi-trailing arms out back...but each part was just a little bit better in the new car. 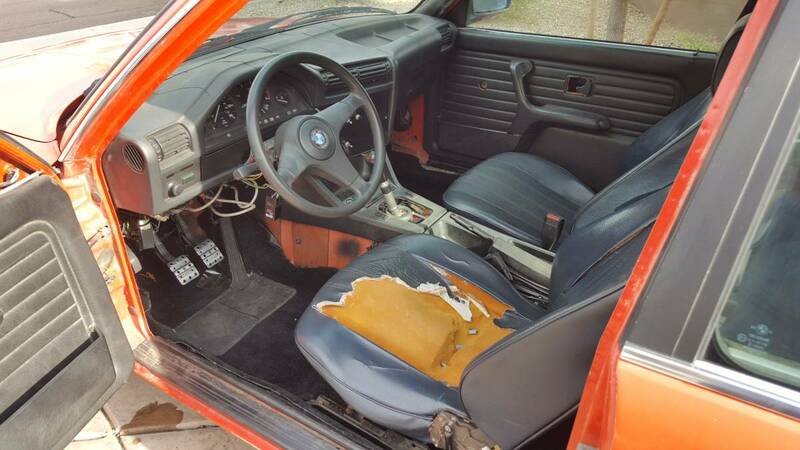 Today's 325e has taken another leap forward. 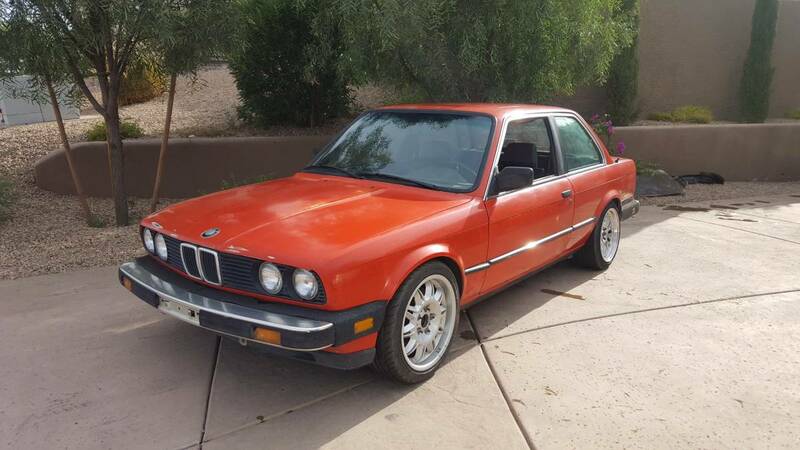 Find this 1984 BMW 340i with M62 V8 swap offered for $5,499 in Fountain Hills, AZ via craigslist. This E30 is just slightly on the beater side of the junker/treasure curve, but it is what's inside that counts...or at least that is what everybody keeps telling me. Don't judge a crook by his mother...#amidoingthisright? Somebody is doing something right here...just take a look under that hood. 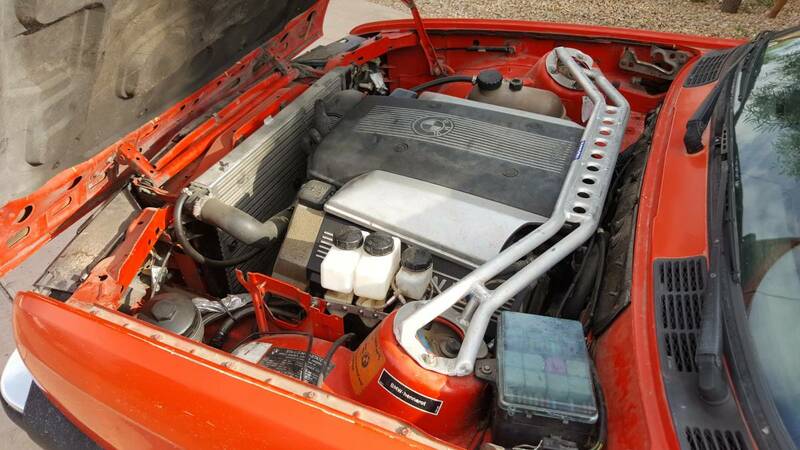 The M62 V8 comes from a 1997 BMW 540i, which means it is VANOS free and makes 282 horsepower and 310 ft-lbs of torque. Mated to a 6-speed manual gearbox, this little Frankenstein should seriously scoot. The 5-series it was borrowed from may have taken 5.6 seconds to hit 60 mph, but the lightweight 3-series will be considerably faster. The interior is pretty well torn up, but a few newish/er seats are just a short trip to your local pick-a-part or a BMW forum. Cleaning up the wires and other cockpit descuzification is only going to cost you some time and elbow grease. OK BMW guys, how do the iron block 6's compare weight wise to the alloy v8? Seems like you could get a lot more power without a weight penalty . a) I know nothing about the M20 'small' sixes. 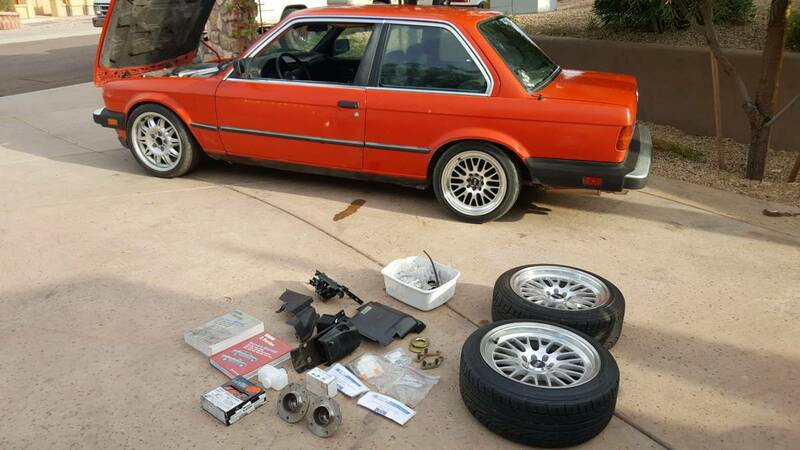 b) I'm a partner in a Lemons E30 with an M30 'big' six swap. I don't know what the motor weighs, but it barely fits in the hole, working on the distributor means pulling the radiator. c) I own three street BMWs with M62-ish motors, an M62, an M62TU, and an S62. They're not heavy, expect they're lighter than the M30. They're also shorter. But they are wider, much wider. FYI the factory number on the M62 is 200kg (440lb) with all the front-end accessories. Probably does not include flywheel/torque converter. The E30 is a brilliant, amazingly simple car. The M62 motor is light but not small. An LS3 is smaller but a bit heavier. But it's all academic as the CL post is gone.